If your kids have ever dreamed of pirates, knights, princesses or fairies…then you need to pack up these little dreamers and take them to the place where these dreams can be real! My family and I have found a place where these characters come to life…at the Arizona Renaissance Festival! The Arizona Renaissance Festival is a medieval amusement park, a 13-stage theater, a 30-acre circus, an arts and crafts fair, a jousting tournament and a feast — all rolled into one non-stop, day-long family adventure! The Faire runs from 10am to 6pm (rain or shine) on Saturdays and Sundays from February 6 to March 27, including President’s Day on February 15th. The Festival is seven miles east of Apache Junction on US Highway 60. The Renaissance Festival is a place where you and your family can experience over 200 handcrafted items, have a sword fight with a pirate, watch knights joust to the death, dance to the reed pipes of a fairy, laugh with the village fool or even gain audience with the King and his courtisans! Hop on a “man-powered” merry-go-round, ride a giant rocking horse, have a go at the crossbow or just take a load off on the lawn and catch the Bird of Prey show to see how traditional falconry was done! Even the booths are hand-crafted works of art. There are hair weavers, face painters, candle makers, pottery artists, leather and metal workers…the list goes on! My family of 5 have been attending for several years and we wouldn’t miss it! There has been something for all of my ages to experience, learn from and participate in every year we have attended. We love mixing in with the villagers dressed in our renaissance finest and talking with the various artisans about their unique skills. I have brought my princesses, my fairies, my warlocks, my pirates, my knights and even my robin hood and we fit in perfectly in this fully immersive renaissance experience. Plan to spend the entire day! Munch on traditional turkey legs, steaks on sticks or take a sweet trip to heaven as you pass by any number of amazing chocolate covered treasures to be found all over the faire. Some of the entertainment can be quite a mixed bag of joyful and inappropriate (this is, after all, the renaissance!). I have attended without incident with all my children on a variety of days (just avoiding the shows with more adult-oriented humor). But if you would like to avoid the “bawdy” all together, I highly recommend attending on “Student Days” on March 1st and 3rd. This is a very special day when the more rambunctious crowd is toned down to make way for the likes of Galileo, Medicis, Shakespeare, Magellan and so much more! These two days cater especially to teachers and students to help bring to life the language, science, arts, engineering and overall ambiance of the 16th Century. Tickets are $23 for adults and $11 for kids (ages 5-12). Discount tickets are available here or check their website for a coupon partner near you. You can also hook up with their facebook page and join in the 16th century fun to win one of their daily giveaways! Want to come with your teacher and all your classroom friends?? Then you need to enter their “Renaissance in the Southwest 2016 Essay Contest”! Teachers, this is a spectacular way to help your kids get excited about history! Traffic can be a problem getting there…plan to leave at least an hour or two early if you can. But once you get there, parking is free and very well organized. They do not allow outside food and drink but when I have come with children under the age of 5, they have allowed me to bring small snacks, bottles and drinks specifically and only for these little ones. But I would try to pack light…they won’t let you bring coolers or any large items. It’s dusty! If you have allergies or are otherwise affected by the dust, be prepared. It can be very warm! Wear sunscreen…a hat…bring a fan…you will be much more comfortable! Bring water…you can refill at drinking fountains throughout the park. There are bathrooms throughout the faire but the lines can be long…try to get your little ones to go before you get there. Leave your pets at home…they will not be allowed into the park. Costumes are super fun and usually will win the attention of the street performers for an even more interactive and fun experience! There are 8 ATM’s located across the Festival grounds but I would recommend having cash on hand. The food can be a bit pricey but well worth the experience and you won’t want to miss out on purchasing some one-of-a-kind souvenirs from your time traveling adventures! 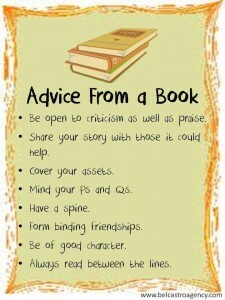 As our world speedily seeks to replace books with technology, our good old paperback friends have a little advice before they disappear into the background of our lives! I know it’s on every parents mind. This is the new world of technology we live in. The internet in all it’s glory, amazement and horror are so easily accessible for our children at all times and seemingly in all places. It is becoming increasingly difficult to monitor, police, educate and generally protect our children as best we can from some of the onslaughts that await them in the interactive world we live in. But does that mean we give up?? NO! We have some amazing tools to tell you about! First, for those of you with kids either using their own cell phones/tablets or using yours, you might wonder how can you get some control over interactive content on these devices. Our first tip is to download the Mobicip app! It is a free browser available through the app store or through their website at http://www.mobicip.com/. Once you have this browser on your device, you want to disable the safari browser or whatever browser came standard on your device. We are iphone users so we also have enabled all the security restrictions in our settings where we can control whether to allow app purchases, what apps are visible, etc. which is all password protected. At that point, the only browser available will be the Mobicip browser. Within the browser settings, you can set restrictions that are age appropriate for each user. Very handy when you have various ages using the same devices! Now on to the computer issue. We HIGHLY recommend a program called NetNanny which can be purchased and downloaded at http://www.netnanny.com/. This program allows you to customize your settings for family members, customize your filter settings, receive reports regarding user accessed content, immediate text/email should one of your users attempt to access restricted material, and a log of every page visited by each user. This has become an invaluable tool for my family and I hope you will take a moment to review all the amazing features available through this program. We hope you will continue to be vigilant on your children’s behalf in helping to protect them from the dangers of the internet while teaching them responsible habits in using their technology. Please weigh in on this issue with any suggestions you have found to work well in your own families and together we can help protect our families! 23rd Annual Celebration of Fine Art...come see the artists at work! Yes, spring break is upon us and if you are anything like me, you are scrambling to keep kids busy with things other than video games and movies! In my hunt for the affordable (and hopefully sneaking in that somewhat educational!) entertainment in the Valley of the Sun, I have discovered a real gem! Today I took my five children (ages 2 through 12) to the Celebration of Fine Art in Scottsdale, AZ. The show highlights work from over 100 artists, some local and some traveling from out of state to attend. What’s fun about a glorified outdoor art museum you might ask? Well, the coolest thing about this art exhibit is the artists are actually on site WORKING on their art! You can ask questions, see demonstrations of their technique, or just shoot the breeze about the latest trends. My kids LOVE that they can actually see the artists at work and ask questions! My youngest loved all the colors and because many of the artists enjoy bringing their pets on site, he LOVED playing with the friendly little pups resting at the foot of several of the artists. One particular artist today painted birds and could mimic a bird call so convincingly that we had to look around for a minute for the bird before we realized it was her! Whitney Peckman was one of our favorite artists! 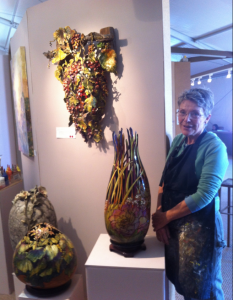 Here she displays some of her hand sculpted and painted gourds. Amazing! Rather than learn from art teachers who are bound by certain techniques they are required to teach, these artists have no such restrictions and they truly let their imaginations go wild with the off-the-wall techniques they’ve invented, the customized processes they’ve had to discover and the media they have developed to answer that creative call! When we arrived home this afternoon from over 3 hours there, my kids all rushed to our art cabinet and immediately took to making their own wildly creative pieces with all their new ideas! Looking to get inspired? This is your chance! When we arrived home this afternoon from over 3 hours there, my kids all rushed to our art cabinet and immediately took to making their own wildly creative pieces with all their new ideas! The event runs through March 24th and is open daily from 10am to 6pm. It’s located on the SW corner of Hayden Rd. and Loop 101 (Exit 35 from the 101). Just look for the big white tents! The best part?? It’s FREE for kids under 12!!! Yes, that’s right…FREE! Adults are $10 but if you go to the 23rd Annual Celebration of Fine Art website, you can download a 2 for 1 coupon for adult tickets. Are your kids working on their geography in school this year? Do they just have an insatiable curiosity for how the world is laid out? Check out www.mapsofworld.com. You can find world political maps, terrain maps, Thematic maps (like the richest countries or the countries with the highest crime rates), maps of individual countries and even maps in different languages! The site is easy to navigate and very user friendly for young kids. check it out and if your little ones are as curious as mine, be prepared to navigate this site for quite awhile with them! You know what? My daughter was RIGHT! Being more along the artistic and music side myself, flashcards did nothing more than frustrate and bore me as a kid too and I have to admit, they’re not any more interesting as an adult! While they do still have their place in education, we have stumbled across some wonderful activities that can not only be fun, but of equal educational benefit. And even better, YOU can make these at home! And in most cases, for less than a dollar! The first is a number game. Take a rope of about two feet and knot it at one end. Insert this knotted end into a whiffle ball. Take a couple of pool noodles of varying colors (ours were blue, yellow, white and pink) and cut from the end 2 three inch cylinders from each color plus one extra from the color of your choice. Write a number on each cylinder, 1-9. 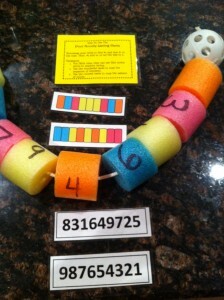 Now you can create any number of combinations of colors or numbers for your child to try to duplicate. Your child can then string the appropriate color or number in order onto the string that you attached to the whiffle ball. This not only works on dexterity but on color and number recognition as well as pattern association…and it’s lots of fun! The second activity we have for you is called a Tangram. For those of you unfamiliar with Tangrams, they are a puzzle brought out of China. Using several predetermined shapes (click here to check out a site devoted to Tangram printouts), your child can move the shapes around until they create a recognizable shape. They can either try to duplicate shapes already created, or make up their own. The catch is that all the shapes must be used and none of them can overlap! It’s quite a challenge! Now we don’t want to leave out those early readers! So here’s one more activity that’s great to help them with their phonograms as they start to learn how to blend sounds and recognize letter combinations. Take a plastic easter egg. On one side of the seam where the egg comes together, write the letter combination “at”. One the other side of the seam write “h”, “r”, “c” and “b”…one above the other along the seam. Now when you twist the egg, the “at” will align with one of the other letters to form a word. 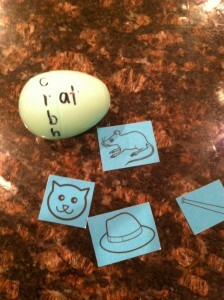 You can print small pictures of a “hat”, a “rat”, a “cat” and a “bat” and cut them out to fit inside the egg. As your child twists the egg and discovers the new letter combinations, they can try to guess what’s inside the egg! 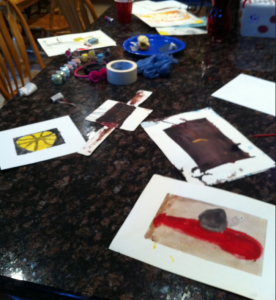 We hope you enjoy some of these learning crafts with your children! Happy “back-to-school” month! If you have any fun learning crafts that you have found helpful, please share them in the comments! We’d love to hear what has worked for you and your family! Stepping out of your fears and into your greatness requires great courage. Sometimes we are so busy with the work of life that we don’t sit still and take the time to listen to our heart. Being courageous means not allowing life to steal, kill, or destroy your dreams, hopes, aspirations, and plans but living in the now, the moment, the presence of your power to receive life, and the fullness of all life has to offer and even more abundantly. It takes courage to be honest with yourself, acknowledge your personal truth, and be present in your quest to live that truth. The easiest thing for high achievers to do is be successful. But living in the fullness of who they are – and want to be – while also maintaining their success takes true grit. Exponential Living is achieved through excellence in your Personal, Spiritual, and Emotional health, and balance in all aspects of your life – with yourself and others. It is achieved by building and maintaining spirituality; loving and caring for yourself (hobbies, exercise, “me” time); spending quality time with and appreciating yourself and your family; recognizing your success; and living in your own truth. When living exponentially you are comfortable with who you are, separate from what you do. It’s when you live in a state of true contentment, being present with yourself and others while also pursuing and maintaining excellence in all aspects of your life. Often, high achievers are limited by their success because they are only living in the accomplishments in one area of their lives. They have achieved or have the drive to achieve high levels of professional success but are not truly fulfilled with their lives overall. Or, they have reached their career goals but now know there are other facets of life they want to pursue but don’t know what/how/why/when. Exponential Living gives such high achievers the power of being true to themselves and achieving a balance between work, family, friends, healthy living, and spiritual commitment to manifest a life that is genuinely complete and content. One of the definitions of the word overwhelmed is “to give too much of a thing.” When you truly desire to live a life that is fulfilled in all areas, you are destined to have more to do than you have the time, energy, and ability or help to accomplish or complete. The feeling of being overwhelmed is when you have what you need and are overflowing with what you want. When you have so much success, opportunity, potential, clients, projects, options, prosperity that you can’t “handle” or manage everything, your reaction is that you are overwhelmed. So what about those times when you’re overwhelmed with challenges, struggles, health issues, and other life concerns? Know the plan for your life is perfect and the struggles are never to defeat you but to make you stronger and uncover your true power. Surrender and find peace living in the overflow, joy and abundance of being overwhelmed. Believe it or not, whatever you want is available to you if you have the confidence and belief that you can have what you want and that you deserve it. This does not mean confidence in our degrees, our knowledge, job titles, position, social status, etc. Instead, it is about having a pure and honest confidence in the person you are. Many successful people have achieved career success through their fear of failure. And while such fear can be a powerful and effective motivator, it can also limit your sense of accomplishment and impede growth in other areas of your life. For many high achievers, confidence is built on external validations like applause, accolades, wins, or promotions. And their ensuring quest to feel this rush keeps them from being engaged in other areas of their lives. True confidence should come from a life well lived and enjoyed…not the proverbial feathers in your cap. When you are constantly working, you seldom recognize your achievements. Without taking these moments to recognize your accomplishments, you are constantly stretching for what’s next and never appreciating and enjoying what you have completed. This cycle often leads to burn out, health issues, personal relationship issues, and low self esteem. And, many times, it does not have a clearly defined end of moment of victory. When you change your mindset from working to maximizing opportunities, you reposition your thought process and how you approach your life. You are able to separate and segment your work from other areas of your life because maximizing the opportunity has a beginning and an end. You are quicker to recognize when to end or remove your self because you understand what you are spending your time on is meant to be an opportunity not a burden you spend time on with out benefit or value. High achievers should strive to tap into their personal P.O.W.E.R., which is Perspective, Ownership, Wisdom, Engagement, and Reward. Perspective cultivates recognition of what is draining your life and what is enriching your life. This leads to Ownership of your relationship with yourself and with others. It allows you to establish your personal boundaries and define what and where you are to give of yourself and your time. This understanding of your own truth is a major component of Wisdom, which is gained from how you implement your life experiences into your life and evolve your thinking and decisions through expanding your knowledge and good judgment. This enlightenment brings consistent Engagement in the quality of your life. Your desire, energy, and personal encouragement will motivate you to commit yourself to stop spending 100% of your time on 10% of who you are – this is your Reward. This book follows the story of a “small mouse, a scared mouse, a stay-at-home mouse” as he gains courage from his big sister to venture out into the scary territory of “the big ginger cat with green eyes” in search of a special chocolate treat. Your kids will love this cute adventure as he “runs this way and that, harum-scarum, round and back” on his way to becoming a “bold-as-a-lion mouse”! The clever illustrations and misunderstandings as Squeek tries to understand the world around him are truly priceless and will have your kids giggling as he overcomes his fear of the unknown with the help of his sister. This book is a treasure trove of 5 minute Halloween spins on traditional Disney stories. If you’re kids are even remotely fans of Disney’s arsenal of creative characters, they will love seeing their heroes and villains figure out their Halloween fears with humor and wit! Each story is only about 5 minutes long, making this a favorite bedtime choice for my kids since each one can pick out their own story and we can fly through them before bedtime with no trouble at all! The illustrations are of course first rate (after all, it’s DISNEY!) and are in several different styles appropriate to the stories and characters they are depicting. This is by far our favorite pick of the season! We have read it so many times, it has now become a memorized favorite! The rhyming cadence of the story lends itself well to a singsong story telling adventure! David McPhail’s incredible water color illustrations truly capture the imagination and the excitement of the story. Follow John Pig as he decides he’s too scared to go out trick or treating with his friends and instead commits to “sit in the shadows, with no costume on”. But he gets a spooky fun surprise when a witch arrives at his door and decides to teach him what Halloween is all about! She invites her ghoulish friends and shows John some “tricks” for his “treats” as they whip up a monster bash not to be forgotten! You be the judge whether John missed out on trick or treating or whether his friends missed out on staying at home!